The 737 was first 'regional jet' of the jet age. As the 707 (and DC-8) series became more common on the rosters of the major airlines, the focus was shifting toward an aircraft that was more economical on the less-traveled routes and the tri-engined 727 was born. Even then, the need for an aircraft that could operate out of smaller airports with a minimum of support, as well as operate on the shorter hops was envisioned. Boeing developed the 737 to answer these needs. Designed to reuse as much of the engineering from the 707 and 727 programs, the 737 is a twin-engined aircraft powered by the JT8D engine and initially came in two configurations - the 737-100 and the stretched 737-200. The 737-100 would carry 85 passengers in a mixed-class configuration, while the 737-200 would accommodate an additional 10 passengers in the same configuration. The next-generation 737 was powered by the CFM-56 engine, which would power all subsequent versions of the aircraft. This next generation included the 737-300, -400, -500, and these were, in turn, replaced by the 737-600, -700, -800, and -900, with each generation adopting new technologies incorporated into other Boeing airline designs. The newest generation coming online is the 737-MAX, which adds addition aerodynamic enhancements along with a more efficient engine. It is ironic that this early regional jet would outlast the 707, 717, 727, 747, 757, and 767 as Boeing continues the stretch and enhance the 737 to compliment the 777 and 787 programs. If you're waiting for a version of this kit with your favorite airline represented, you may be waiting for a long time. 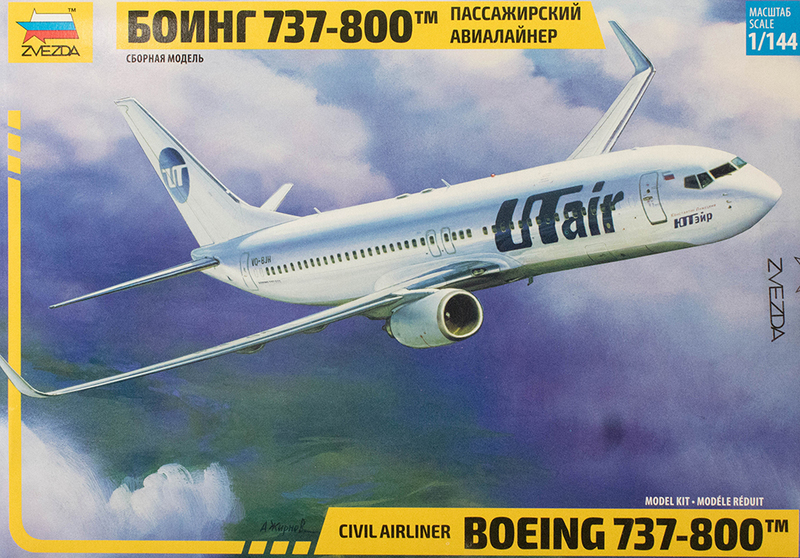 While UTair doesn't deal with licensing of their corporate logos and likely appreciates the free advertising by being featured in this kit, most western (especially US) airlines charge licensing fees for the privilege of advertising their airline. As if they're not popular enough with all of the passenger, pet, luggage, and other mishaps in the news. If you shop around however, you may find the markings you seek in the aftermarket and you're not paying the additional licensing fee that is added to the kit's price for a scheme you don't want anyway. 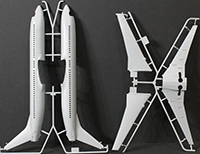 This is another impressive addition to the 1/144 scale flightline, and while some modelers may not consider 1/144 too seriously, I would dread giving up enough display shelf space for a larger scale model, especially given the size of this aircraft in this scale. As you can see on the box art, this kit is licensed by Boeing, and Zvezda has done a good job with this kit.